How Much Does A Removable Pool Fence Cost? You’ve probably been researching the subject of investing in a pool fence for a while now. A pool fence is a necessity for pool owners. What do you make of your neighbors’ kids coming over to your home occasionally? Knowing how adventuresome such kids could be, it’s better to err on the side of caution and prevent accidents from happening. Let’s start off by addressing some of the questions you might have regarding removable pool fences. 1. What is a removable mesh pool fence? This is a safety complement to your pool that can be removed and replaced with ease. Best of all, a mesh pool fence can be laid out on most water features, pools or spas. A removable pool fence comprises of evenly spaced poles (usually 30 inches or so) that hold a high tensile mesh in place to ward off intrusions to the pool. The mesh is made of extra-strong material to keep it from being torn easily. Further, the poles are laid out in 15-foot sections or spaced based on a homeowner’s needs. The poles are light, yet sturdy enough to keep the pool area secure. The lightweight material used in the poles makes them easy to remove or to replace the pool fence, thereby making the fence convenient and easy to use. Removable mesh pool fence is an affordable and recommended pool safety option. 2. Why is a removable mesh pool fence recommended over other pool safety products? A removable fence is a valuable resource for the pool. You can simply remove and set it aside, a process that only takes a couple of minutes. Similarly, if you are holding a party and would like to use part of the space in the pool area, you can simply remove the fence. Such ease of use or even storage has made removable fences a popular choice for residential pool owners. The components that make up the fence are also industry tested to prove their strength and quality. This implies that when a homeowner invests in a removable pool fence, they can be assured of a reliable product that is strong, efficient and durable. In fact, such fences are in compliance with most building code requirements for home pools, making them an invaluable part of your pool. Moreover, a removable fence cannot be tampered with by kids due to its high tension. Likewise, children would have a very difficult time trying to clamber over the fence, as it does not offer supports of sluts that could facilitate their attempts. The aesthetic value of your pool is also of importance. Many pool owners would prefer to invest in a pool fence that maintains the beauty and appeal of their pool. As such, a removable fence does its job perfectly, without negating the pool owners’ secondary need. 3. What is the cost of a removable mesh pool fence? 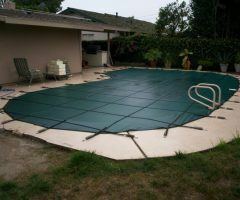 A onetime all-inclusive investment of between $1,000 and $2,500 is sufficient to get your removable pool fence set up. Some of the aspects that determine the cost of the fence include the size of the pool area, the height of the fence, additions such as gates, and the slope of the pool area. The surface on which the fence is to be installed could also affect the overall costs. 4. How can you purchase a removable mesh pool fence? Purchasing a removable pool fence is a simple process that involves contacting your local dealer. Once you submit a free quote form, a local dealer conducts an initial site visit and assessment of the cost. Thereafter, the dealer will offer you a free estimate of the expected costs and weigh with you the most suitable option. With such knowledge at hand, you can then make the step towards securing your pool by investing in a removable All-Safe pool fence that guarantees you of safety, convenience, and peace of mind. ← Which Pool Covers Are Best At Saving Water?